This smoked paprika mahi-mahi is a perfect weeknight meal as it only takes 8 to 10 minutes to cook. You might like to marinate the fish in lemon juice for an hour before cooking it, but that's optional. It's fine to go straight from fridge to oven. The Spanish smoked paprika provides a rich flavor that accents the fish's sweetness and a splash of lemon juice add just the right amount of brightness. For a quick way to layer the flavor on any fish dish, try adding a flavor-packed butter. You can either serve the butter on the side in a small ramekin or simply dollop a tablespoon directly on top of your mahi-mahi when you plate it. Place an oven rack in top position and turn on the broiler. Line a baking sheet with foil. Or get your grill pan ready by heating it and adding a little olive oil and spread a tablespoon or more of soft butter on each side of the filet. Drizzle filets with olive oil on both sides if broiling and spread soft butter if using a grill pan, then sprinkle lightly with smoked paprika and a dash of chipotle powder. Broil for 7 to 8 minutes until fish is just barely opaque in the center, turning once during the broiling process. If using a grill pan, once the pan is hot, sear the first side of mahi-mahi. Press down firmly with a metal fish spatula to cook evenly and ensure good grill marks. Once you see the color change halfway up the side of the fish, flip over to other side and cook until the opaque look is completely gone on the side of the filet. Have plates warming in the oven if using a grill pan. 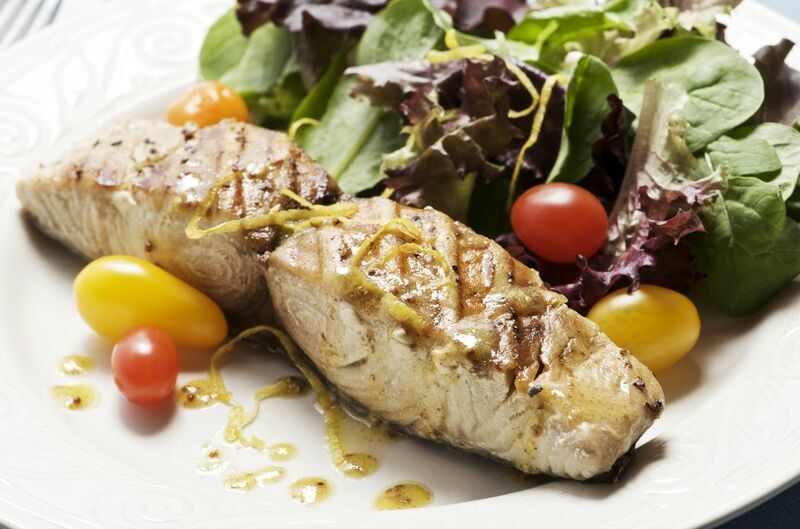 When plating, serve the mahi-mahi with additional lemon wedges, a flavored butter* and a mixed greens salad with cherry tomatoes, carrots and crumbled feta cheese with a light balsamic dressing. * Flavored butters are easy to make and store for a few weeks in a refrigerator and up to a month in the freezer. Make them a day or two before using so they have time to harden. Edited by Joy Nordenstrom, Romantic Meals' Expert.